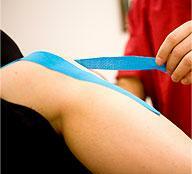 « What is Kinesiology Therapeutic Tape Made From? Now that you’ve learned proper application techniques, the next logical step is to learn how to remove kinesiology tape! The adhesive in both Kinesio Tape and SpiderTech Tape is designed to adhere for up to 5 days. This is the point at which skin cells begin to be sloughed off, which helps loosen the tape for easier removal. There are two slightly different techniques for removing kinesiology tape. Try them both and see which is more comfortable for you. With one hand, press down firmly on the skin at the end of the taped area. Use the other hand to gently roll or peel the tape back. As the tape is lifted, continue to press the other hand as close to the intersection of skin and tape as possible. 2. Find a tape end that has loosened and gently pull it straight back with one hand. As you continue to exert a backward pull on the tape, Place the index finger of the other hand where the tape joins the skin, then slide the finger back and forth. It is more comfortable to remove tape in the direction of hair growth, which is usually away from the center of the body on the trunk, and in a downward direction on the arms or legs. Tape that is still strongly adhered to skin after 5 days may be loosened by soaking with baby oil or olive oil for 15-20 minutes before attempting to remove it.